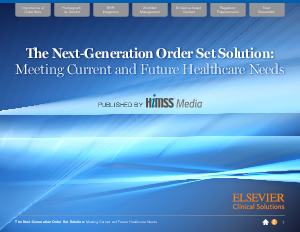 > Elsevier Inc. > Are Your Order Sets in Order? Learn How InOrder by Elsevier Can Help. White Paper Published By: Elsevier Inc.
Healthcare transformation is driving healthcare providers to focus on quality, value-based purchasing and accountable care. While CPOE (computerized physician order entry) has become an important tool to meet their goals, a robust order set integrated within CPOE is critical, as a December 2013 HIMSS Analytics survey revealed. Responses from nearly 500 healthcare organizations highlighted the current state of healthcare providers’ order set deployment, use, and needs. Survey results revealed that the common challenges respondents faced with their order set solutions were lack of integration with an electronic health record (EHR) and lack of functionality and usability, both of which lead to underutilization and suboptimal clinical workflow. Providers that deployed homegrown order sets have found that their solutions are not flexible enough and do not have the right functionality to meet regulatory mandates and quality performance initiatives. Providers with older solutions, as well, are experiencing the same setbacks.